Following are the main material flow patterns and problems routinely encountered by the industries in a storage hopper. 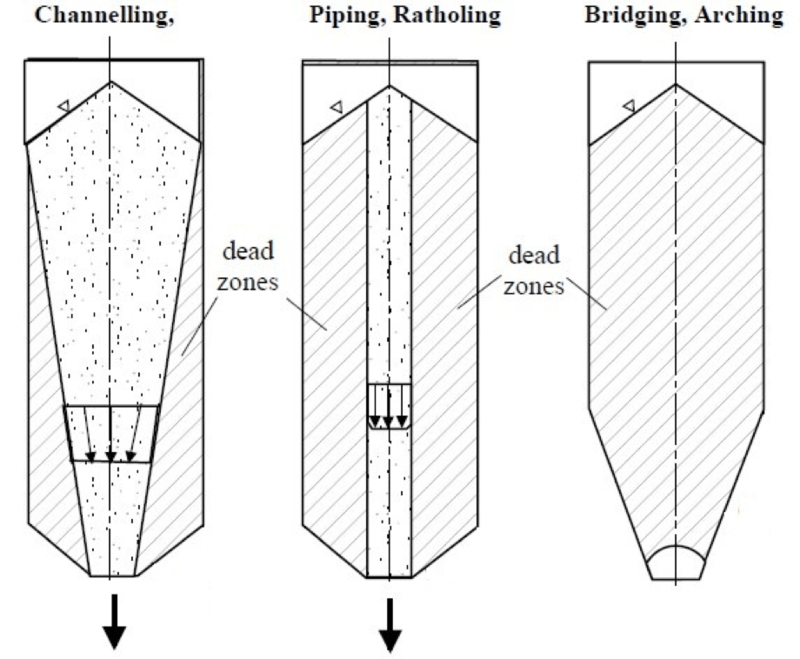 The flow patterns are illustrated in the figures given below and measures to fix them with Mass Flow Hopper. Funnel Flow: The material starts flowing from the top surface in a conical fashion representing a funnel shape and the material near the wall is stagnant. This results in a first in last out flow pattern and can also result in material segregation problems. Core or Ratholing Flow: The material starts flowing from the top surface in the form of a cylinder at the central portion of the hopper and all the material surrounding this central hole upto the wall is stagnant. This results in a first in last out flow pattern and can also result in material segregation problems. Bridging or Arching Flow: The material does not flow at all and forms a stable arch just above the hopper discharge. Arching may be due to the mechanical interlocking of large particles or cohesive locking of fine particles due to factors like humidity, temperature, pressure etc,. Operators generally overcome the above problems by using sledge hammers, poking of the material using rods either from the bottom or from the holes made on the sides of the wall, use external mechanical vibrators, provide internal pneumatic lines etc., to make the powder flow. All the above methods employed are temporary solutions and further leads to other type of problems. Mass Flow: The best solution for the above material flow problems is a mass flow pattern, where at any instant of time, all the solid particles are flowing vertically downwards towards the outlet of the hopper. This will ensure that there is no stagnation of the material inside the hopper. Mass flow ensures that the material which first filled the hopper is the first to go out of the hopper. To achieve this, the hopper walls must be sufficiently steep and smooth to reduce the friction. 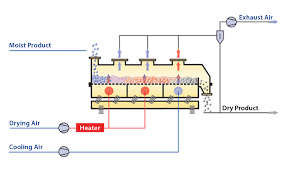 Check hot air dryer design for more information. Mass Flow Hopper: To design a mass flow hoppers, the properties of the powder must be generated in a shear cell tester. Typical results of the powder tests for mass flow hopper are given below. DRYING is a very versatile and important unit process for the Process Industry. The process that results in reduction of moisture content in a given material is known as DRYING. We will now discuss how to obtain a perfect hot air dryer design. The simplest and hence traditional method of drying a material, specially agricultural material in a country like India, has been to merely spread it under the sun and use the thermal energy available from the sun to gradually evaporate the water. Drying under the sun or the simple solar drying, though the easiest form of drying, has enough limitations since it requires long duration of drying, large area requirement for the material to be spread , vagaries of nature, etc. This is why, the Industry that is interested in a achieving and maintaining a steady output from the manufacturing facility , consistent quality in terms of its moisture content, best value for money, looks for a well designed mechanised hot air dryer design. Here again, relevant expertise is needed to identify the appropriate drying machine out of the several that are available now viz. tunnel dryer, rotary dryer, fluidised bed hot air dryer design, flash hot air dryer design, vacuum hot air dryer design, impingement dryer, etc. Every material has its own drying characteristics and it requires thorough process engineering knowledge to understand the mutual dependence of the various operating parameters involved in the drying process. It is the job of the Process Engineer to make hot air dryer for a given material which starts with studying the drying characteristics in the Lab. While it is one option to a hot air design from the first principles of arriving at the individual transfer coefficients with respect to heat and mass transfer that takes place all through the drying process, the other and most reliable method is to extrapolate the overall coefficient from study on a prototype dryer. Achieving energy economy during drying is an important objective that the designer has to target. This involves conceptualising and detailing the method of recycling the hot air that exhausts from the dryer. One often argues asking the question how can the exhaust air be recycled when it contains so much of moisture ? 'Against such questions my typical reply is: ‘ leave it to the expert to calculate and decide much to recycle and how much of the exhaust air to be let out in the final exhaust’. Usually, the rate of moisture removal during the initial part of drying is high and then it gradually starts dropping as the material loses more and more moisture. Supply hot air and not recycling is meaningless since the energy bill becomes drastically high with such zero recycle. This is where the control dynamics becomes important. The process control introduced in dryers plays around with the percent recycle in the pilot plant design. In the initial phases of drying the recycle percentage is maintained low and as the drying progresses, the percentage recycle is increased.